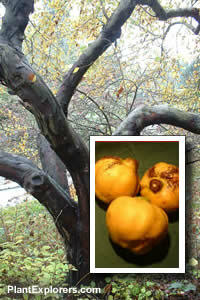 A large shrub or small tree to 20ft., the Quince is an excellent choice for almost any garden. The aromatic fruit has a vaguely citrus-like scent and is rich in pectin for making fine traditional jellies. The fruit, with a somewhat gritty texture like a pear, turns deep pink when cooked. It has a number of uses in traditional medicine, and even more in traditional Mediterranean cooking. Historically it was added to apple pies, or mixed with sweet spices to accompany meat and poultry dishes. Although named varieties do not come true from seed, the plants from this supply will produce fruit of good, though variable quality. The seeds are not edible and must be removed from the fruit before cooking. Cydonia, named after the town of Cydon in Crete, is an ancient fruit that never seems to have caught on much in North America. Cultivation of quince may have preceded apple culture, and many references translated to "apple", such as the fruit in Song of Solomon, may have been a quince. Among the ancient Greeks, the quince was a ritual offering at weddings, for it had come from the Levant with Aphrodite and remained sacred to her. Plutarch reported that a Greek bride would nibble a quince to perfume her kiss before entering the bridal chamber, "in order that the first greeting may not be disagreeable nor unpleasant"
For maximum freshness, please keep seed refrigerated in its original packaging until it is time to plant. Sow seed in containers as soon as your seed order arrives. Fall sowings may be made directly into pots of sterilized potting medium and placed in a coldframe. For spring sowings, the seed should be soaked in pure clean water then placed in pots of sterilized growing medium and refrigerated for 3-4 weeks. Move pots to a coldframe to germinate. Grow in well-drained, moderately fertile soil in full sun.